See more objects with the tag men, container, personal, travel, mother of pearl, dressing room, leisure, silver, utility, tool, vegetal, accessories, foliate, rectangular, writing, portable, Victorian, toolbox, hygiene, grooming. This object is the first item in a set that contains one other object. 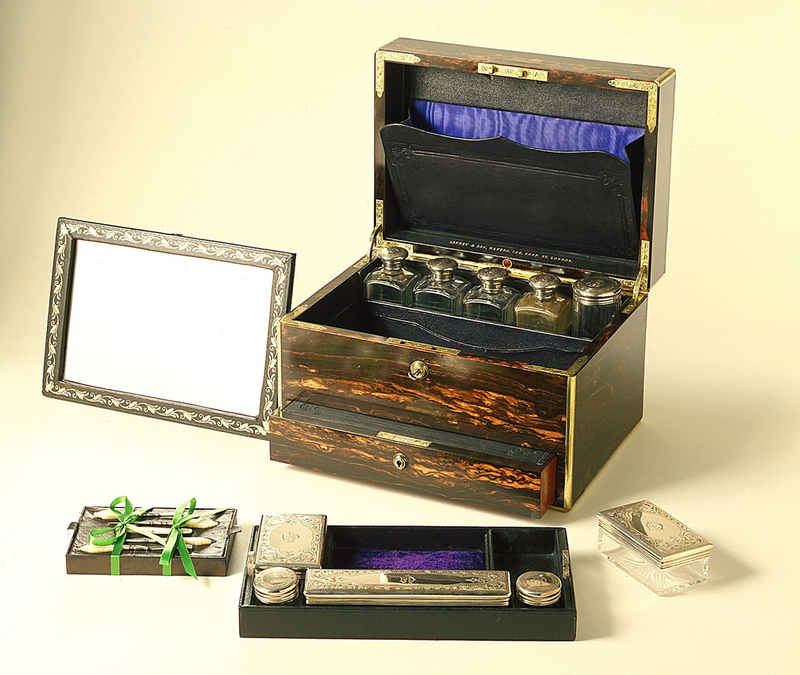 This is a Traveling Dressing Table Set. It was silversmith Thomas Whitehouse and retailed by Asprey & Son Co.. We acquired it in 1984. Its medium is coromandel-veneered joined wood, lined with silk, gilded and tooled calfskin leather, raised, chased and engraved silver, cut glass, mirrored glass, carved mother-of-pearl (handles), cut and engraved brass (hinges and tools), gilt-metal, forged steel (imp. It is a part of the Product Design and Decorative Arts department. 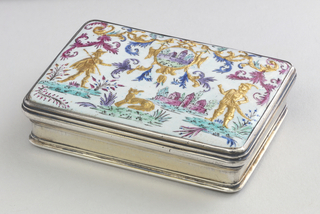 Unlike today, when air travel requires carry-on toiletry liquids to be in clear plastic bags and other containers, in the 19th century, this elegant dressing-table box would have held stylish and functional implements. The owner probably had someone to carry it for him or her, so considerations such as weight and sturdiness were not paramount. 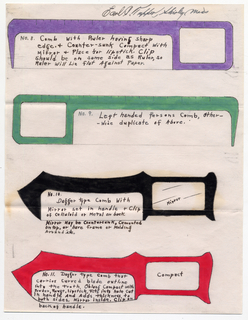 While both sexes availed themselves of such boxes, with minor variations of implements, this example appears more likely to have been a man’s. 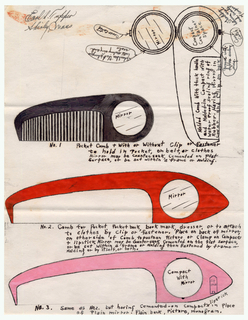 In 1870s London, a man might have had creams for his hair and wax for his moustache, colognes and manicure equipment, and buttonhooks and other items needed for dressing. 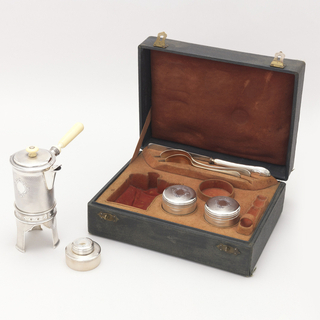 The leisure classes were likely to communicate by mail as well, often several times a day, so this traveling case provides pouches for stationery, pen, inkwell, and sander, as well as a surface in a concealed drawer for composing (and perhaps hiding) correspondence. This object was featured in our Object of the Day series in a post titled Fashionable cases fit for travel. This object was donated by Danny J. H. Kauffman. 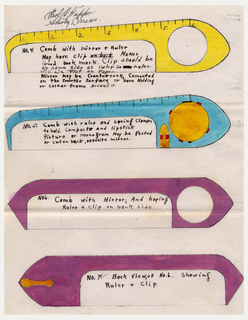 This object was previously on display as a part of the exhibitions	The Virtue in Vice and Tools: Extending Our Reach.